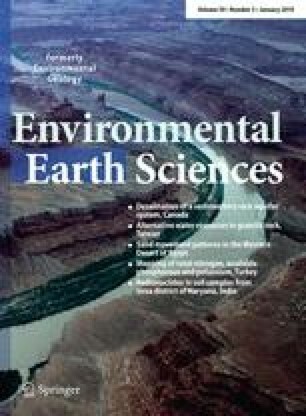 The objective of this study was to identify geochemical processes and Quaternary geological events responsible for the variations in groundwater geochemistry observed in a sedimentary rock aquifer system, including brackish to saline groundwater. Inorganic constituents and environmental isotopes were analyzed for 146 groundwater samples. Dissolution of carbonates dominates in recharge areas, resulting in Ca-, Mg-HCO3 groundwater. Further along flow paths, under confined conditions, Ca2+–Na+ ion exchange causes groundwater evolution to Na-HCO3 type. Na-Cl groundwater is also found and it falls on a seawater mixing line. Using conservative tracers, Cl− and Br−, the original Champlain Sea water is shown to have been, in the region, a mixture of about 34% seawater and 66% freshwater, a composition still retained by some groundwater. Na-Cl groundwater thus results from mixing with former Champlain Sea water and also from solute diffusion from overlying marine clay. The system is thus found to be at different stages of desalinization, from the original Champlain Sea water still present in hydraulically stagnant areas of the aquifer to fully flushed conditions in parts, where more flow occurs, especially in recharge zones. The geochemical processes are integrated within the hydrogeological context to produce a conceptual geochemical evolution model for groundwater of the aquifer system. The project was carried out by the Geological Survey of Canada (GSC), in collaboration with INRS-Eau, Terre & Environnement (INRS-ETE), Université Laval and Environment Canada. Funding and support for the study came from the GSC, Economic Development Canada, Regional County Municipalities (RCM) of Argenteuil, Mirabel, Deux-Montagnes and Thérèse-de-Blainville, Québec Environment Ministry, Conseil Régional de Développement-Laurentides, and Association des Professionnels de Développement Économique des Laurentides. Financial support for V. Cloutier was provided by the Natural Sciences and Engineering Research Council (NSERC) of Canada, Fonds québécois de la recherche sur la nature et les technologies, and INRS-ETE as postgraduate scholarships. NSERC also supported R. Lefebvre and R. Therrien through operating grants. We acknowledge the Québec Environment Ministry for providing the analyses of inorganic constituents in groundwater. The drilling was partly supported by the Québec Ministry of Transportation. The authors thank Marc Luzincourt (Delta-Lab, GSC-Québec) for stable isotopes analyses and Magalie Roy (UQAT) for illustrations. We also thank Dr. Stephen Grasby, Dr. Ken Howard and Dr. Alfonso Rivera, who provided valuable comments on an early manuscript as members of Cloutier’s thesis committee. Finally, the authors wish to thank Dr. Jan Schwarzbauer (Associate editor) and an anonymous reviewer who have provided constructive comments, which helped improve the original manuscript. The work of all students involved in the project as field assistants, and the collaboration of the population of the RCM giving site access are greatly appreciated.